Not to be confused with Titan (moon). This article is about Uranus' moon. For the character in the William Shakespeare play, A Midsummer Night's Dream, see Titania. 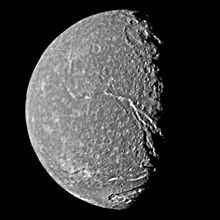 Titania is the largest of the moons of Uranus and the eighth largest moon in the Solar System at a diameter of 1,578 kilometres (981 mi). Discovered by William Herschel in 1787, Titania is named after the queen of the fairies in Shakespeare's A Midsummer Night's Dream. Its orbit lies inside Uranus's magnetosphere. Titania consists of approximately equal amounts of ice and rock, and is probably differentiated into a rocky core and an icy mantle. A layer of liquid water may be present at the core–mantle boundary. The surface of Titania, which is relatively dark and slightly red in color, appears to have been shaped by both impacts and endogenic processes. It is covered with numerous impact craters reaching up to 326 kilometres (203 mi) in diameter, but is less heavily cratered than Oberon, outermost of the five large moons of Uranus. Titania probably underwent an early endogenic resurfacing event which obliterated its older, heavily cratered surface. Titania's surface is cut by a system of enormous canyons and scarps, the result of the expansion of its interior during the later stages of its evolution. Like all major moons of Uranus, Titania probably formed from an accretion disk which surrounded the planet just after its formation. 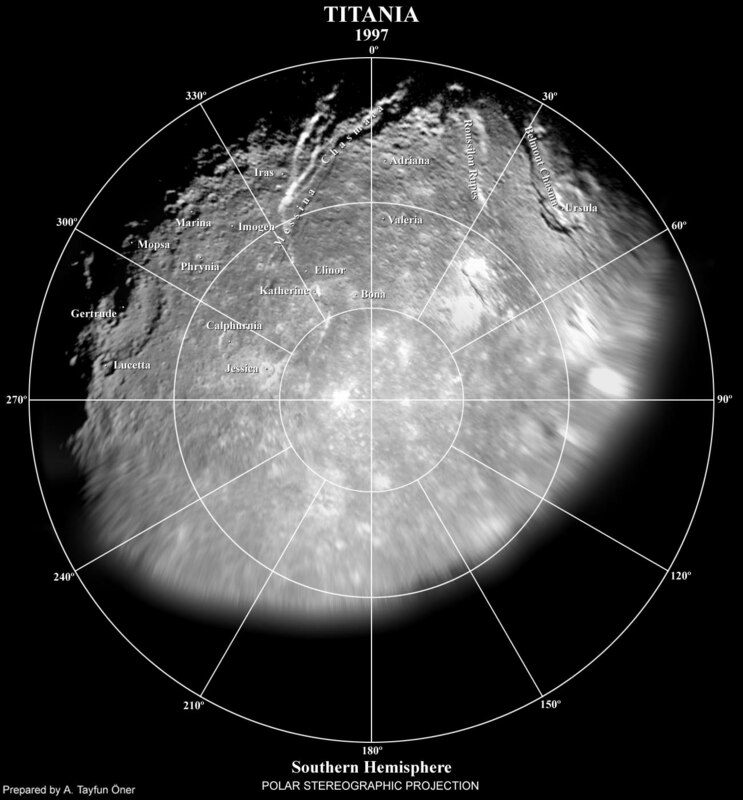 Infrared spectroscopy conducted from 2001 to 2005 revealed the presence of water ice as well as frozen carbon dioxide on the surface of Titania, which in turn suggested that the moon may have a tenuous carbon dioxide atmosphere with a surface pressure of about 10 nanopascals (10−13 bar). Measurements during Titania's occultation of a star put an upper limit on the surface pressure of any possible atmosphere at 1–2 mPa (10–20 nbar). The Uranian system has been studied up close only once, by the spacecraft Voyager 2 in January 1986. It took several images of Titania, which allowed mapping of about 40% of its surface. Titania was discovered by William Herschel on January 11, 1787, the same day he discovered Uranus's second largest moon, Oberon. 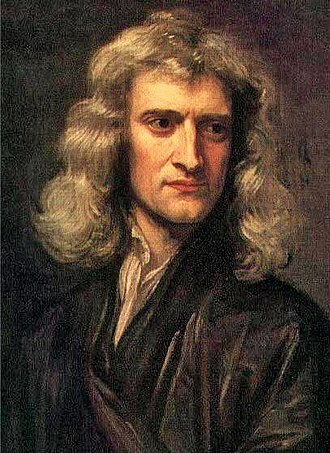 He later reported the discoveries of four more satellites, although they were subsequently revealed as spurious. For nearly fifty years following their discovery, Titania and Oberon would not be observed by any instrument other than William Herschel's, although the moon can be seen from Earth with a present-day high-end amateur telescope. 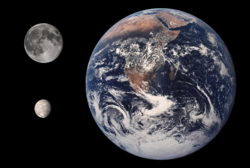 Size comparison of Earth, the Moon, and Titania. All of Uranus's moons are named after characters created by William Shakespeare or Alexander Pope. The name Titania was taken from the Queen of the Fairies in A Midsummer Night's Dream. The names of all four satellites of Uranus then known were suggested by Herschel's son John in 1852, at the request of William Lassell, who had discovered the other two moons, Ariel and Umbriel, the year before. Titania was initially referred to as "the first satellite of Uranus", and in 1848 was given the designation Uranus I by William Lassell, although he sometimes used William Herschel's numbering (where Titania and Oberon are II and IV). In 1851 Lassell eventually numbered all four known satellites in order of their distance from the planet by Roman numerals, and since then Titania has been designated Uranus III. Shakespeare's character's name is pronounced /tɪˈteɪnjə/, but the moon is often pronounced /taɪˈteɪniə/, by analogy with the familiar chemical element titanium. The adjectival form, Titanian, is homonymous with that of Saturn's moon Titan. The name Titania is ancient Greek in origin, meaning "Daughter of the Titans". Titania orbits Uranus at the distance of about 436,000 kilometres (271,000 mi), being the second farthest from the planet among its five major moons. [g] Titania's orbit has a small eccentricity and is inclined very little relative to the equator of Uranus. Its orbital period is around 8.7 days, coincident with its rotational period. In other words, Titania is a synchronous or tidally locked satellite, with one face always pointing toward the planet. Titania's orbit lies completely inside the Uranian magnetosphere. This is important, because the trailing hemispheres of satellites orbiting inside a magnetosphere are struck by magnetospheric plasma, which co-rotates with the planet. 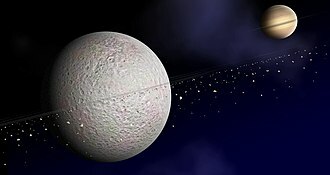 This bombardment may lead to the darkening of the trailing hemispheres, which is actually observed for all Uranian moons except Oberon (see below). Because Uranus orbits the Sun almost on its side, and its moons orbit in the planet's equatorial plane, they (including Titania) are subject to an extreme seasonal cycle. Both northern and southern poles spend 42 years in a complete darkness, and another 42 years in continuous sunlight, with the sun rising close to the zenith over one of the poles at each solstice. The Voyager 2 flyby coincided with the southern hemisphere's 1986 summer solstice, when nearly the entire southern hemisphere was illuminated. Once every 42 years, when Uranus has an equinox and its equatorial plane intersects the Earth, mutual occultations of Uranus's moons become possible. In 2007–2008 a number of such events were observed including two occultations of Titania by Umbriel on August 15 and December 8, 2007. Voyager 2's highest-resolution image of Titania shows moderately cratered plains, enormous rifts and long scarps. Near the bottom, a region of smoother plains including the crater Ursula is split by the graben Belmont Chasma. 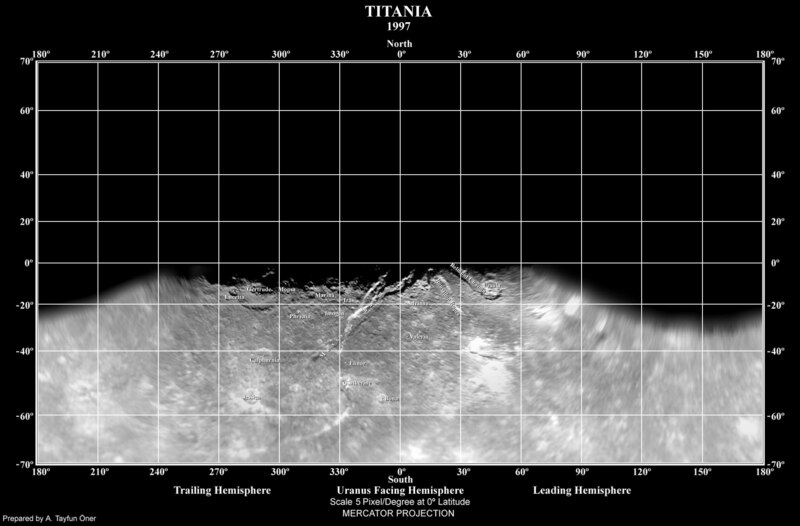 Titania is the largest and most massive Uranian moon, and the eighth most massive moon in the Solar System. [h] Its density of 1.71 g/cm³, which is much higher than the typical density of Saturn's satellites, indicates that it consists of roughly equal proportions of water ice and dense non-ice components; the latter could be made of rock and carbonaceous material including heavy organic compounds. 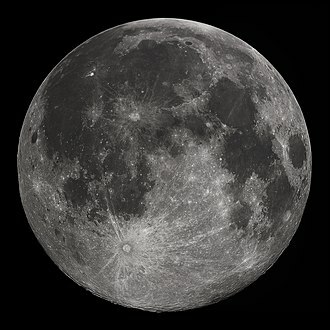 The presence of water ice is supported by infrared spectroscopic observations made in 2001–2005, which have revealed crystalline water ice on the surface of the moon. Water ice absorption bands are slightly stronger on Titania's leading hemisphere than on the trailing hemisphere. This is the opposite of what is observed on Oberon, where the trailing hemisphere exhibits stronger water ice signatures. The cause of this asymmetry is not known, but it may be related to the bombardment by charged particles from the magnetosphere of Uranus, which is stronger on the trailing hemisphere (due to the plasma's co-rotation). The energetic particles tend to sputter water ice, decompose methane trapped in ice as clathrate hydrate and darken other organics, leaving a dark, carbon-rich residue behind. Except for water, the only other compound identified on the surface of Titania by infrared spectroscopy is carbon dioxide, which is concentrated mainly on the trailing hemisphere. The origin of the carbon dioxide is not completely clear. It might be produced locally from carbonates or organic materials under the influence of the solar ultraviolet radiation or energetic charged particles coming from the magnetosphere of Uranus. The latter process would explain the asymmetry in its distribution, because the trailing hemisphere is subject to a more intense magnetospheric influence than the leading hemisphere. Another possible source is the outgassing of the primordial CO2 trapped by water ice in Titania's interior. The escape of CO2 from the interior may be related to the past geological activity on this moon. Titania may be differentiated into a rocky core surrounded by an icy mantle. If this is the case, the radius of the core 520 kilometres (320 mi) is about 66% of the radius of the moon, and its mass is around 58% of the moon's mass—the proportions are dictated by moon's composition. The pressure in the center of Titania is about 0.58 GPa (5.8 kbar). The current state of the icy mantle is unclear. If the ice contains enough ammonia or other antifreeze, Titania may have a subsurface ocean at the core–mantle boundary. The thickness of this ocean, if it exists, is up to 50 kilometres (31 mi) and its temperature is around 190 K. However the present internal structure of Titania depends heavily on its thermal history, which is poorly known. Titania with surface features labeled. The south pole is situated close to the unidentified bright crater below and left of the crater Jessica. Among Uranus's moons, Titania is intermediate in brightness between the dark Oberon and Umbriel and the bright Ariel and Miranda. Its surface shows a strong opposition surge: its reflectivity decreases from 35% at a phase angle of 0° (geometrical albedo) to 25% at an angle of about 1°. Titania has a relatively low Bond albedo of about 17%. Its surface is generally slightly red in color, but less red than that of Oberon. However, fresh impact deposits are bluer, while the smooth plains situated on the leading hemisphere near Ursula crater and along some grabens are somewhat redder. There may be an asymmetry between the leading and trailing hemispheres; the former appears to be redder than the latter by 8%. [i] However, this difference is related to the smooth plains and may be accidental. The reddening of the surfaces probably results from space weathering caused by bombardment by charged particles and micrometeorites over the age of the Solar System. However, the color asymmetry of Titania is more likely related to accretion of a reddish material coming from outer parts of the Uranian system, possibly, from irregular satellites, which would be deposited predominately on the leading hemisphere. Scientists have recognized three classes of geological feature on Titania: craters, chasmata (canyons) and rupes (scarps). The surface of Titania is less heavily cratered than the surfaces of either Oberon or Umbriel, which means that the surface is much younger. 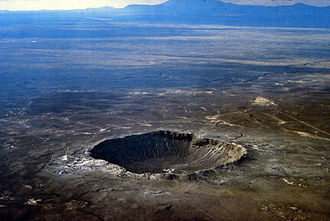 The crater diameters reach 326 kilometers for the largest known crater, Gertrude (there can be also a degraded basin of approximately the same size). Some craters (for instance, Ursula and Jessica) are surrounded by bright impact ejecta (rays) consisting of relatively fresh ice. All large craters on Titania have flat floors and central peaks. The only exception is Ursula, which has a pit in the center. To the west of Gertrude there is an area with irregular topography, the so-called "unnamed basin", which may be another highly degraded impact basin with the diameter of about 330 kilometres (210 mi). Titania's surface is intersected by a system of enormous faults, or scarps. In some places, two parallel scarps mark depressions in the satellite's crust, forming grabens, which are sometimes called canyons. The most prominent among Titania's canyons is Messina Chasma, which runs for about 1,500 kilometres (930 mi) from the equator almost to the south pole. The grabens on Titania are 20–50 kilometres (12–31 mi) wide and have a relief of about 2–5 km. The scarps that are not related to canyons are called rupes, such as Rousillon Rupes near Ursula crater. The regions along some scarps and near Ursula appear smooth at Voyager's image resolution. These smooth plains were probably resurfaced later in Titania's geological history, after the majority of craters formed. The resurfacing may have been either endogenic in nature, involving the eruption of fluid material from the interior (cryovolcanism), or, alternatively it may be due to blanking by the impact ejecta from nearby large craters. The grabens are probably the youngest geological features on Titania—they cut all craters and even smooth plains. The geology of Titania was influenced by two competing forces: impact crater formation and endogenic resurfacing. The former acted over the moon's entire history and influenced all surfaces. The latter processes were also global in nature, but active mainly for a period following the moon's formation. They obliterated the original heavily cratered terrain, explaining the relatively low number of impact craters on the moon's present-day surface. Additional episodes of resurfacing may have occurred later and led to the formation of smooth plains. Alternatively smooth plains may be ejecta blankets of the nearby impact craters. The most recent endogenous processes were mainly tectonic in nature and caused the formation of the canyons, which are actually giant cracks in the ice crust. The cracking of the crust was caused by the global expansion of Titania by about 0.7%. Surface features on Titania are named for female characters from Shakespeare's works. The presence of carbon dioxide on the surface suggests that Titania may have a tenuous seasonal atmosphere of CO2, much like that of the Jovian moon Callisto. [j] Other gases, like nitrogen or methane, are unlikely to be present, because Titania's weak gravity could not prevent them from escaping into space. At the maximum temperature attainable during Titania's summer solstice (89 K), the vapor pressure of carbon dioxide is about 300 μPa (3 nbar). On September 8, 2001, Titania occulted a bright star (HIP106829) with a visible magnitude of 7.2; this was an opportunity to both refine Titania's diameter and ephemeris, and to detect any extant atmosphere. The data revealed no atmosphere to a surface pressure of 1–2 mPa (10–20 nbar); if it exists, it would have to be far thinner than that of Triton or Pluto. This upper limit is still several times higher than the maximum possible surface pressure of the carbon dioxide, meaning that the measurements place essentially no constraints on parameters of the atmosphere. The peculiar geometry of the Uranian system causes the moons' poles to receive more solar energy than their equatorial regions. Because the vapor pressure of CO2 is a steep function of temperature, this may lead to the accumulation of carbon dioxide in the low-latitude regions of Titania, where it can stably exist on high albedo patches and shaded regions of the surface in the form of ice. During the summer, when the polar temperatures reach as high as 85–90 K, carbon dioxide sublimates and migrates to the opposite pole and to the equatorial regions, giving rise to a type of carbon cycle. The accumulated carbon dioxide ice can be removed from cold traps by magnetospheric particles, which sputter it from the surface. Titania is thought to have lost a significant amount of carbon dioxide since its formation 4.6 billion years ago. Titania is thought to have formed from an accretion disc or subnebula; a disc of gas and dust that either existed around Uranus for some time after its formation or was created by the giant impact that most likely gave Uranus its large obliquity. The precise composition of the subnebula is not known; however, the relatively high density of Titania and other Uranian moons compared to the moons of Saturn indicates that it may have been relatively water-poor. [k] Significant amounts of nitrogen and carbon may have been present in the form of carbon monoxide and N2 instead of ammonia and methane. The moons that formed in such a subnebula would contain less water ice (with CO and N2 trapped as a clathrate) and more rock, explaining their higher density. Titania's accretion probably lasted for several thousand years. The impacts that accompanied accretion caused heating of the moon's outer layer. The maximum temperature of around 250 K (−23 °C) was reached at a depth of about 60 kilometres (37 mi). After the end of formation, the subsurface layer cooled, while the interior of Titania heated due to decay of radioactive elements present in its rocks. The cooling near-surface layer contracted, while the interior expanded. This caused strong extensional stresses in the moon's crust leading to cracking. Some of the present-day canyons may be a result of this. The process lasted for about 200 million years, implying that any endogenous activity ceased billions of years ago. The initial accretional heating together with continued decay of radioactive elements were probably strong enough to melt the ice if some antifreeze like ammonia (in the form of ammonia hydrate) or salt was present. Further melting may have led to the separation of ice from rocks and formation of a rocky core surrounded by an icy mantle. A layer of liquid water (ocean) rich in dissolved ammonia may have formed at the core–mantle boundary. The eutectic temperature of this mixture is 176 K (−97 °C). If the temperature dropped below this value, the ocean would have subsequently frozen. The freezing of the water would have caused the interior to expand, which may have been responsible for the formation of the majority of the canyons. However, the present knowledge of Titania's geological evolution is quite limited. So far the only close-up images of Titania have been from the Voyager 2 probe, which photographed the moon during its flyby of Uranus in January 1986. Since the closest distance between Voyager 2 and Titania was only 365,200 km (226,900 mi), the best images of this moon have a spatial resolution of about 3.4 km (only Miranda and Ariel were imaged with a better resolution). The images cover about 40% of the surface, but only 24% was photographed with the precision required for geological mapping. 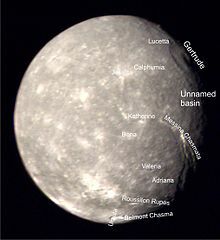 At the time of the flyby, the southern hemisphere of Titania (like those of the other moons) was pointed towards the Sun, so the northern (dark) hemisphere could not be studied. No other spacecraft has ever visited the Uranian system or Titania, and no mission is currently planned. 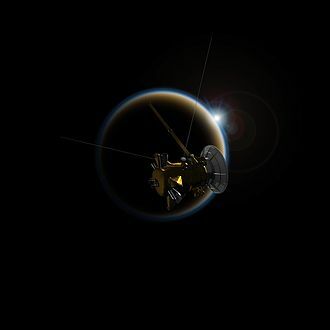 One possibility, now discarded, was to send Cassini on from Saturn to Uranus in an extended mission. Another mission concept proposed was the Uranus orbiter and probe concept, evaluated around 2010. Uranus was also examined as part of one trajectory for a precursor interstellar probe concept, Innovative Interstellar Explorer. A Uranus orbiter was listed as the third priority for a NASA Flagship mission by the NASA Planetary Science Decadal Survey, and conceptual designs for such a mission are currently being analyzed. ^ Along the terminator are visible the moon's largest known impact crater, Gertrude, at upper right and several enormous canyon-like grabens (the Messina Chasmata above, Belmont Chasma near bottom) at lower right. ^ ti-TAY-nee-ə, ty-. The former pronunciation is distinct from the adjectival form of Saturn's moon Titan. ^ Calculated on the basis of other parameters. ^ Surface area derived from the radius r : 4πr². ^ Volume v derived from the radius r : 4πr³/3. ^ Surface gravity derived from the mass m, the gravitational constant G and the radius r : Gm/r². ^ The five major moons are Miranda, Ariel, Umbriel, Titania and Oberon. ^ The seven moons more massive than Titania are Ganymede, Titan, Callisto, Io, Earth's Moon, Europa, and Triton. ^ The color is determined by the ratio of albedos viewed through the green (0.52–0.59 μm) and violet (0.38–0.45 μm) Voyager filters. ^ The partial pressure of CO2 on the surface of Callisto is about 10 nPa (10 pbar). ^ For instance, Tethys, a Saturnian moon, has the density of 0.97 g/cm³, which implies it contains more than 90% of water. ^ a b Herschel, W. S. (1787). "An Account of the Discovery of Two Satellites Revolving Round the Georgian Planet". Philosophical Transactions of the Royal Society of London. 77: 125–129. doi:10.1098/rstl.1787.0016. JSTOR 106717. ^ a b "Merriam-Webster online dictionary: titania". Merriam-Webster. 2009. Retrieved 2009-09-26. ^ a b c d e "Planetary Satellite Mean Orbital Parameters". Jet Propulsion Laboratory, California Institute of Technology. Retrieved 2009-10-06. ^ a b c d e f g h i Widemann, T.; Sicardy, B.; Dusser, R.; Martinez, C.; Beisker, W.; Bredner, E.; Dunham, D.; Maley, P.; Lellouch, E.; Arlot, J. -E.; Berthier, J.; Colas, F.; Hubbard, W. B.; Hill, R.; Lecacheux, J.; Lecampion, J. -F.; Pau, S.; Rapaport, M.; Roques, F.; Thuillot, W.; Hills, C. R.; Elliott, A. J.; Miles, R.; Platt, T.; Cremaschini, C.; Dubreuil, P.; Cavadore, C.; Demeautis, C.; Henriquet, P.; et al. (February 2009). "Titania's radius and an upper limit on its atmosphere from the September 8, 2001 stellar occultation" (PDF). Icarus. 199 (2): 458–476. Bibcode:2009Icar..199..458W. doi:10.1016/j.icarus.2008.09.011. ^ a b Jacobson, R. A.; Campbell, J. K.; Taylor, A. H.; Synnott, S. P. (June 1992). "The masses of Uranus and its major satellites from Voyager tracking data and earth-based Uranian satellite data". The Astronomical Journal. 103 (6): 2068–2078. Bibcode:1992AJ....103.2068J. doi:10.1086/116211. ^ a b c d e f g h i j k l m Smith, B. A.; Soderblom, L. A.; Beebe, A.; Bliss, D.; Boyce, J. M.; Brahic, A.; Briggs, G. A.; Brown, R. H.; Collins, S. A. (4 July 1986). "Voyager 2 in the Uranian System: Imaging Science Results". Science. 233 (4759): 43–64. Bibcode:1986Sci...233...43S. doi:10.1126/science.233.4759.43. PMID 17812889. ^ a b c Karkoschka, Erich (2001). "Comprehensive Photometry of the Rings and 16 Satellites of Uranus with the Hubble Space Telescope". Icarus. 151 (1): 51–68. Bibcode:2001Icar..151...51K. doi:10.1006/icar.2001.6596. ^ a b Newton, Bill; Teece, Philip (1995). The guide to amateur astronomy. Cambridge University Press. p. 109. ISBN 978-0-521-44492-7. ^ Herschel, W. S. (1 January 1788). "On the Georgian Planet and Its Satellites". Philosophical Transactions of the Royal Society of London. 78: 364–378. Bibcode:1788RSPT...78..364H. doi:10.1098/rstl.1788.0024. ^ Herschel, William, Sr. (1 January 1798). "On the Discovery of Four Additional Satellites of the Georgium Sidus. The Retrograde Motion of Its Old Satellites Announced; And the Cause of Their Disappearance at Certain Distances from the Planet Explained". Philosophical Transactions of the Royal Society of London. 88: 47–79. Bibcode:1798RSPT...88...47H. doi:10.1098/rstl.1798.0005. ^ Struve, O. (1848). "Note on the Satellites of Uranus". Monthly Notices of the Royal Astronomical Society. 8 (3): 44–47. Bibcode:1848MNRAS...8...43L. doi:10.1093/mnras/8.3.43. ^ Herschel, John (March 1834). "On the Satellites of Uranus". Monthly Notices of the Royal Astronomical Society. 3 (5): 35–36. Bibcode:1834MNRAS...3...35H. doi:10.1093/mnras/3.5.35. ^ Kuiper, G. P. (1949). "The Fifth Satellite of Uranus". Publications of the Astronomical Society of the Pacific. 61 (360): 129. Bibcode:1949PASP...61..129K. doi:10.1086/126146. ^ Lassell, W. (1852). "Beobachtungen der Uranus-Satelliten". Astronomische Nachrichten (in German). 34: 325. Bibcode:1852AN.....34..325. ^ Lassell, W. (1851). "On the interior satellites of Uranus". Monthly Notices of the Royal Astronomical Society. 12: 15–17. Bibcode:1851MNRAS..12...15L. doi:10.1093/mnras/12.1.15. ^ Lassell, W. (1848). "Observations of Satellites of Uranus". Monthly Notices of the Royal Astronomical Society. 8 (3): 43–44. Bibcode:1848MNRAS...8...43L. doi:10.1093/mnras/8.3.43. ^ Lassell, W. (1850). "Bright Satellites of Uranus". Monthly Notices of the Royal Astronomical Society. 10 (6): 135. Bibcode:1850MNRAS..10..135L. doi:10.1093/mnras/10.6.135. ^ Lassell, William (December 1851). "Letter from William Lassell, Esq., to the Editor". Astronomical Journal. 2 (33): 70. Bibcode:1851AJ......2...70L. doi:10.1086/100198. ^ a b c d e f g h i j k l m Grundy, W. M.; Young, L. A.; Spencer, J. R.; Johnson, R. E.; Young, E. F.; Buie, M. W. (October 2006). "Distributions of H2O and CO2 ices on Ariel, Umbriel, Titania, and Oberon from IRTF/SpeX observations". Icarus. 184 (2): 543–555. arXiv:0704.1525. Bibcode:2006Icar..184..543G. doi:10.1016/j.icarus.2006.04.016. ^ Ness, Norman F.; Acuña, Mario H.; Behannon, Kenneth W.; Burlaga, Leonard F.; Connerney, John E. P.; Lepping, Ronald P.; Neubauer, Fritz M. (July 1986). "Magnetic Fields at Uranus". Science. 233 (4759): 85–89. Bibcode:1986Sci...233...85N. doi:10.1126/science.233.4759.85. PMID 17812894. ^ Miller, C.; Chanover, N. J. (March 2009). "Resolving dynamic parameters of the August 2007 Titania and Ariel occultations by Umbriel". Icarus. 200 (1): 343–346. Bibcode:2009Icar..200..343M. doi:10.1016/j.icarus.2008.12.010. ^ Arlot, J. -E.; Dumas, C.; Sicardy, B. (December 2008). "Observation of an eclipse of U-3 Titania by U-2 Umbriel on December 8, 2007 with ESO-VLT". Astronomy and Astrophysics. 492 (2): 599–602. Bibcode:2008A&A...492..599A. doi:10.1051/0004-6361:200810134. ^ "Planetary Satellite Physical Parameters". Jet Propulsion Laboratory (Solar System Dynamics). Retrieved 2009-05-28. ^ a b c d e f Hussmann, Hauke; Sohl, Frank; Spohn, Tilman (November 2006). "Subsurface oceans and deep interiors of medium-sized outer planet satellites and large trans-neptunian objects". Icarus. 185 (1): 258–273. Bibcode:2006Icar..185..258H. doi:10.1016/j.icarus.2006.06.005. ^ a b c d e Bell III, J.F. ; McCord, T. B. (1991). A search for spectral units on the Uranian satellites using color ratio images. Lunar and Planetary Science Conference, 21st, March 12–16, 1990. Houston, TX, United States: Lunar and Planetary Sciences Institute. pp. 473–489. Bibcode:1991LPSC...21..473B. ^ a b c d e f g h i Plescia, J. B. (December 30, 1987). "Cratering history of the Uranian satellites: Umbriel, Titania and Oberon". Journal of Geophysical Research. 92 (A13): 14, 918–14, 932. Bibcode:1987JGR....9214918P. doi:10.1029/JA092iA13p14918. ISSN 0148-0227. ^ a b c Buratti, Bonnie J.; Mosher, Joel A. (March 1991). "Comparative global albedo and color maps of the Uranian satellites". Icarus. 90 (1): 1–13. Bibcode:1991Icar...90....1B. doi:10.1016/0019-1035(91)90064-Z. ISSN 0019-1035. ^ a b c d USGS/IAU. "Titania Nomenclature Table of Contents". Gazetteer of Planetary Nomenclature. USGS Astrogeology. Retrieved 2012-02-23. ^ USGS/IAU (October 1, 2006). "Gertrude on Titania". Gazetteer of Planetary Nomenclature. USGS Astrogeology. Archived from the original on 2013-05-15. Retrieved 2012-02-23. ^ a b c d e f Croft, S. K. (1989). New geological maps of Uranian satellites Titania, Oberon, Umbriel and Miranda. Proceeding of Lunar and Planetary Sciences. 20. Lunar and Planetary Sciences Institute, Houston. p. 205C. Bibcode:1989LPI....20..205C. ^ Strobell, M.E. ; Masursky, H. (1987). "New Features Named on the Moon and Uranian Satellites". Abstracts of the Lunar and Planetary Science Conference. 18: 964–65. Bibcode:1987LPI....18..964S. ^ a b c Mousis, O. (2004). "Modeling the thermodynamical conditions in the Uranian subnebula – Implications for regular satellite composition". Astronomy & Astrophysics. 413: 373–380. Bibcode:2004A&A...413..373M. doi:10.1051/0004-6361:20031515. ^ a b c Squyres, S. W.; Reynolds, Ray T.; Summers, Audrey L.; Shung, Felix (1988). "Accretional Heating of the Satellites of Saturn and Uranus". Journal of Geophysical Research. 93 (B8): 8779–8794. Bibcode:1988JGR....93.8779S. doi:10.1029/JB093iB08p08779. hdl:2060/19870013922. ^ Hillier, John; Squyres, Steven W. (August 1991). "Thermal stress tectonics on the satellites of Saturn and Uranus". Journal of Geophysical Research. 96 (E1): 15, 665–15, 674. Bibcode:1991JGR....9615665H. doi:10.1029/91JE01401. ^ Stone, E. C. (December 30, 1987). "The Voyager 2 Encounter with Uranus" (PDF). Journal of Geophysical Research. 92 (A13): 14, 873–14, 876. Bibcode:1987JGR....9214873S. doi:10.1029/JA092iA13p14873. ISSN 0148-0227. Wikimedia Commons has media related to Titania (moon). "Titania profile". NASA. 1999. Archived from the original on June 13, 2009. Retrieved June 22, 2009. Sicardy, Bruno; Widemann, Thomas (2001). "Is there an atmosphere around Titania, satellite of Uranus?". Paris Observatory. Archived from the original on March 7, 2013. Retrieved June 22, 2009. Widemann, Thomas (2009). "From Titania to large trans-Neptunian objects: ground-based stellar occultations in the quest for the billionth of atmospheric pressure". Paris Observatory. Archived from the original on June 4, 2011. Retrieved June 22, 2009. Italicized moons are not close to being in hydrostatic equilibrium; [bracketed] moons may or may not be close to being in hydrostatic equilibrium. An atmosphere is a layer of gases surrounding a planet or other material body, that is held in place by the gravity of that body. An atmosphere is likely to be retained if the gravity it is subject to is high. The atmosphere of Earth is mostly composed of nitrogen, argon with carbon dioxide, the atmosphere helps protect living organisms from genetic damage by solar ultraviolet radiation, solar wind and cosmic rays. 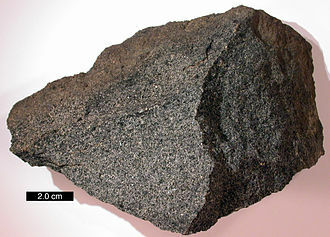 Its current composition is the product of billions of years of modification of the paleoatmosphere by living organisms. The term stellar atmosphere describes the region of a star. Stars with sufficiently low temperatures may form compound molecules in their outer atmosphere, Atmospheric pressure is the force per unit area that is applied perpendicularly to a surface by the surrounding gas. It is determined by a gravitational force in combination with the total mass of a column of gas above a location. On Earth, units of air pressure are based on the recognized standard atmosphere. It is measured with a barometer, the pressure of an atmospheric gas decreases with altitude due to the diminishing mass of gas above. The height at which the pressure from an atmosphere declines by a factor of e is called the height and is denoted by H. For such an atmosphere, the pressure declines exponentially with increasing altitude. However, atmospheres are not uniform in temperature, so the determination of the atmospheric pressure at any particular altitude is more complex. Surface gravity, the force that holds down an atmosphere, differs significantly among the planets, for example, the large gravitational force of the giant planet Jupiter is able to retain light gases such as hydrogen and helium that escape from objects with lower gravity. Thus, the distant and cold Titan and Pluto are able to retain their atmospheres despite their relatively low gravities, rogue planets, may retain thick atmospheres. Since a collection of gas molecules may be moving at a range of velocities. Lighter molecules move faster than ones with the same thermal kinetic energy. It is thought that Venus and Mars may have lost much of their water when, after being photo dissociated into hydrogen and oxygen by solar ultraviolet, Earths magnetic field helps to prevent this, as, the solar wind would greatly enhance the escape of hydrogen. Tidal locking occurs when, over the course of an orbit, there is no net transfer of angular momentum between an astronomical body and its gravitational partner. This state can result from the gradient between two co-orbiting bodies, acting over a sufficiently long period of time. In the case where the orbital eccentricity is zero, tidal locking results in one hemisphere of the revolving object constantly facing its partner. For example, the side of the Moon always faces the Earth. A tidally locked body in synchronous rotation takes just as long to rotate around its own axis as it does to revolve around its partner, only the satellite is tidally locked to the larger body. However, if both the difference between the two bodies and the distance between them are relatively small, each may be tidally locked to the other, this is the case for Pluto. This effect is employed to stabilize some artificial satellites, the possibility of lifeforms existing on tidally-locked planets has been debated. The change in rotation rate necessary to lock a body B to a larger body A is caused by the torque applied by As gravity on bulges it has induced on B by tidal forces. These distortions are known as tidal bulges, when B is not yet tidally locked, the bulges travel over its surface, with one of the two high tidal bulges traveling close to the point where body A is overhead. Smaller bodies experience distortion, but this distortion is less regular, the material of B exerts resistance to this periodic reshaping caused by the tidal force. In effect, some time is required to reshape B to the equilibrium shape. Seen from a point in space, the points of maximum bulge extension are displaced from the axis oriented toward A. Because the bulges are now displaced from the A–B axis, As gravitational pull on the mass in them exerts a torque on B. The torque on the A-facing bulge acts to bring Bs rotation in line with its period, whereas the back bulge. However, the bulge on the A-facing side is closer to A than the bulge by a distance of approximately Bs diameter. The net resulting torque from both bulges, then, is always in the direction that acts to synchronize Bs rotation with its orbital period and this results in a raising of Bs orbit about A in tandem with its rotational slowdown. A temperature is an objective comparative measurement of hot or cold. It is measured by a thermometer, several scales and units exist for measuring temperature, the most common being Celsius, and, especially in science, Kelvin. Absolute zero is denoted as 0 K on the Kelvin scale, −273.15 °C on the Celsius scale, the kinetic theory offers a valuable but limited account of the behavior of the materials of macroscopic bodies, especially of fluids. Temperature is important in all fields of science including physics, chemistry, atmospheric sciences, medicine. The Celsius scale is used for temperature measurements in most of the world. Because of the 100 degree interval, it is called a centigrade scale.15, the United States commonly uses the Fahrenheit scale, on which water freezes at 32°F and boils at 212°F at sea-level atmospheric pressure. 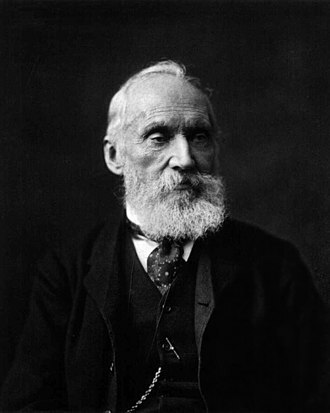 Many scientific measurements use the Kelvin temperature scale, named in honor of the Scottish physicist who first defined it and it is a thermodynamic or absolute temperature scale. Its zero point, 0K, is defined to coincide with the coldest physically-possible temperature and its degrees are defined through thermodynamics. The temperature of zero occurs at 0K = −273. 15°C. 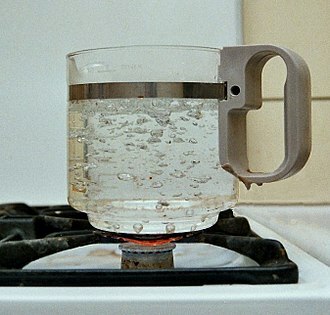 For historical reasons, the triple point temperature of water is fixed at 273.16 units of the measurement increment, Temperature is one of the principal quantities in the study of thermodynamics. There is a variety of kinds of temperature scale and it may be convenient to classify them as empirically and theoretically based. Empirical temperature scales are historically older, while theoretically based scales arose in the middle of the nineteenth century, empirically based temperature scales rely directly on measurements of simple physical properties of materials. For example, the length of a column of mercury, confined in a capillary tube, is dependent largely on temperature. Such scales are only within convenient ranges of temperature. For example, above the point of mercury, a mercury-in-glass thermometer is impracticable. A material is of no use as a thermometer near one of its phase-change temperatures, in spite of these restrictions, most generally used practical thermometers are of the empirically based kind. The Solar System is the gravitationally bound system comprising the Sun and the objects that orbit it, either directly or indirectly. Of those objects that orbit the Sun directly, the largest eight are the planets, with the remainder being significantly smaller objects, such as dwarf planets, of the objects that orbit the Sun indirectly, the moons, two are larger than the smallest planet, Mercury. 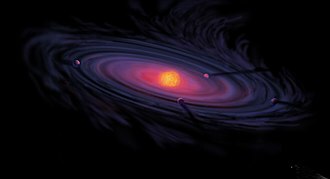 The Solar System formed 4.6 billion years ago from the collapse of a giant interstellar molecular cloud. The vast majority of the mass is in the Sun. The four smaller inner planets, Venus and Mars, are terrestrial planets, being composed of rock. The four outer planets are giant planets, being more massive than the terrestrials. All planets have almost circular orbits that lie within a flat disc called the ecliptic. The Solar System contains smaller objects, the asteroid belt, which lies between the orbits of Mars and Jupiter, mostly contains objects composed, like the terrestrial planets, of rock and metal. Beyond Neptunes orbit lie the Kuiper belt and scattered disc, which are populations of trans-Neptunian objects composed mostly of ices, within these populations are several dozen to possibly tens of thousands of objects large enough that they have been rounded by their own gravity. Such objects are categorized as dwarf planets, identified dwarf planets include the asteroid Ceres and the trans-Neptunian objects Pluto and Eris. In addition to two regions, various other small-body populations, including comets and interplanetary dust clouds. Six of the planets, at least four of the dwarf planets, each of the outer planets is encircled by planetary rings of dust and other small objects. The solar wind, a stream of charged particles flowing outwards from the Sun, the heliopause is the point at which pressure from the solar wind is equal to the opposing pressure of the interstellar medium, it extends out to the edge of the scattered disc. The Oort cloud, which is thought to be the source for long-period comets, the Solar System is located in the Orion Arm,26,000 light-years from the center of the Milky Way. The bar is a metric unit of pressure, but is not approved as part of the International System of Units. It is defined as equal to 100000 Pa, which is slightly less than the current average atmospheric pressure on Earth at sea level. The bar and the millibar were introduced by the Norwegian meteorologist Vilhelm Bjerknes, use of the bar is deprecated by some professional bodies in some fields. The International Astronomical Union lists it under Non-SI units and symbols whose continued use is deprecated, as of 2004, the bar is legally recognized in countries of the European Union. Units derived from the bar include the megabar, decibar, the notation bar, though deprecated by various bodies, represents gauge pressure, i. e. pressure in bars above ambient or atmospheric pressure. The bar is defined using the SI derived unit, pascal,1 bar ≡100000 Pa. Thus,1 bar is equal to,100 kPa 1×105 N/m21000000 Ba, notes,1 millibar =1 one-thousandth bar, or 1×10−3 bar 1 millibar =1 hectopascal. The word bar has its origin in the Greek word βάρος, the units official symbol is bar, the earlier symbol b is now deprecated and conflicts with the use of b denoting the unit barn, but it is still encountered, especially as mb to denote the millibar. Between 1793 and 1795, the bar was used for a unit of weight in an early version of the metric system. Atmospheric air pressure is given in millibars where standard sea level pressure is defined as 1013 mbar,101.3,1.013 bar. Despite the millibar not being an SI unit and weather reporters worldwide have long measured air pressure in millibars as the values are convenient, for example, the weather office of Environment Canada uses kilopascals and hectopascals on their weather maps. 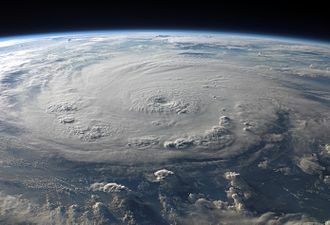 In contrast, Americans are familiar with the use of the millibar in US reports of hurricanes, in fresh water, there is an approximate numerical equivalence between the change in pressure in decibars and the change in depth from the water surface in metres. Specifically, an increase of 1 decibar occurs for every 1.019716 m increase in depth, in sea water with respect to the gravity variation, the latitude and the geopotential anomaly the pressure can be converted into meters depth according to an empirical formula. Alexander Pope was an 18th-century English poet. 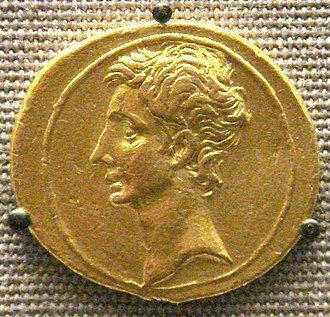 He is best known for his verse and for his translation of Homer. He is the second-most frequently quoted writer in The Oxford Dictionary of Quotations after Shakespeare, Alexander Pope was born to Alexander Pope Senior, a linen merchant of Plough Court, Lombard Street and his wife Edith, who were both Catholics. Ediths sister Christiana was the wife of the miniature painter Samuel Cooper. Pope was taught to read by his aunt, and went to Twyford School in about 1698/99 and he went to two Catholic schools in London. Such schools, while illegal, were tolerated in some areas, in 1700, his family moved to a small estate at Popeswood in Binfield, close to the royal Windsor Forest. 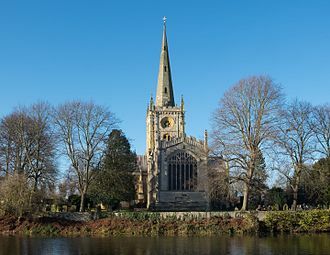 This was due to strong anti-Catholic sentiment and a statute preventing Catholics from living within 10 miles of either London or Westminster, Pope would describe the countryside around the house in his poem Windsor Forest. 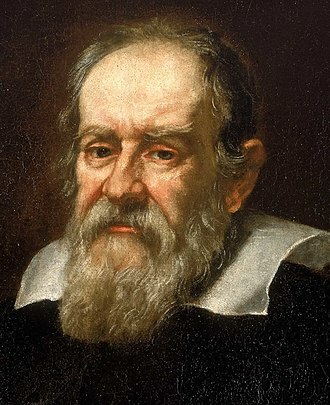 He studied languages and read works by English, Italian, Latin. After five years of study, Pope came into contact with figures from the London literary society such as William Wycherley, William Congreve, Samuel Garth, William Trumbull, at Binfield, he began to make many important friends. 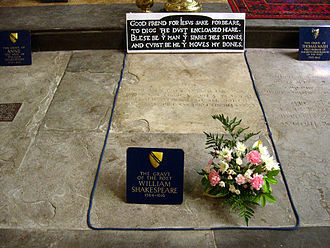 One of them, John Caryll, was twenty years older than the poet and had many acquaintances in the London literary world. He introduced the young Pope to the ageing playwright William Wycherley and to William Walsh, a minor poet and he met the Blount sisters and Martha, both of whom would remain lifelong friends. From the age of 12, he suffered health problems, such as Potts disease. His tuberculosis infection caused other problems including respiratory difficulties, high fevers, inflamed eyes. He grew to a height of only 1.37 m. Pope was already removed from society because he was Catholic, although he never married, he had many female friends to whom he wrote witty letters. Allegedly, his lifelong friend Martha Blount was his lover, in May,1709, Popes Pastorals was published in the sixth part of Tonsons Poetical Miscellanies. A fault scarp is a small step or offset on the ground surface where one side of a fault has moved vertically with respect to the other. It is the expression of faulting attributed to the displacement of the land surface by movement along faults. They are exhibited either by differential movement and subsequent erosion along an old geologic fault. 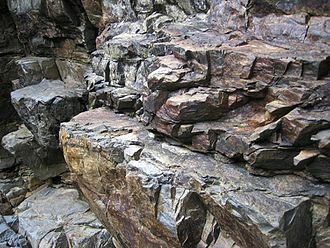 Fault scarps often contain highly fractured rock of both hard and weak consistency, in many cases, bluffs form from the upthrown block and can be very steep. The height of the formation is equal to the vertical displacement along the fault. This movement is usually episodic, with the height of the bluffs being the result of multiple movements over time, displacement of around 5 to 10 meters per tectonic event is common. Due to the dramatic uplift along the fault, the scarp is very prone to erosion. Weathering, mass wasting and water runoff can soon wear down these bluffs, adjacent V-shaped valley formations give the remaining fault spurs a very triangular shape. Atmospheric chemistry is a branch of atmospheric science in which the chemistry of the Earths atmosphere and that of other planets is studied. It is an approach of research and draws on environmental chemistry, meteorology, computer modeling, oceanography and volcanology. Research is increasingly connected with other arenas of such as climatology. The composition and chemistry of the Earths atmosphere is of importance for several reasons, the composition of the Earths atmosphere changes as result of natural processes such as volcano emissions and bombardment by solar particles from corona. It has changed by human activity and some of these changes are harmful to human health, crops. Examples of problems which have been addressed by atmospheric chemistry include acid rain, ozone depletion, photochemical smog, greenhouse gases, the concentration of CO2 and CH4 vary by season and location. The mean molecular mass of air is 28.97 g/mol, Ozone is not included due to its high variability. The ancient Greeks regarded air as one of the four elements, in the late 19th and early 20th centuries interest shifted towards trace constituents with very small concentrations. 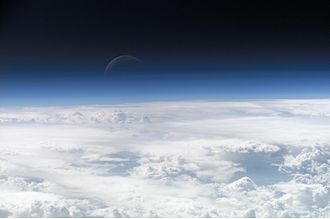 One particularly important discovery for atmospheric chemistry was the discovery of ozone by Christian Friedrich Schönbein in 1840, further studies on ozone issues led to the 1995 Nobel Prize in Chemistry award shared between Paul Crutzen, Mario Molina and Frank Sherwood Rowland. In the 21st century the focus is now shifting again, Atmospheric chemistry is increasingly studied as one part of the Earth system. Instead of concentrating on atmospheric chemistry in isolation the focus is now on seeing it as one part of a system with the rest of the atmosphere and geosphere. Observations, lab measurements, and modeling are the three elements in atmospheric chemistry. Progress in atmospheric chemistry is driven by the interactions between these components and they form an integrated whole. For example, observations may tell us more of a chemical compound exists than previously thought possible. This will stimulate new modelling and laboratory studies which will increase our scientific understanding to a point where the observations can be explained, observations of atmospheric chemistry are essential to our understanding. A magnetosphere is the region of space surrounding an astronomical object in which charged particles are controlled by that objects magnetic field. The magnetic field near the surface of many astronomical objects resembles that of a dipole, the field lines farther away from the surface can be significantly distorted by the flow of electrically conducting plasma emitted from a nearby star. Study of Earths magnetosphere began in 1600, when William Gilbert discovered that the field on the surface of Earth resembled that on a terrella. In the 1940s, Walter M. Elsasser proposed the model of dynamo theory, through the use of magnetometers, scientists were able to study the variations in Earths magnetic field as functions of both time and latitude and longitude. Beginning in the late 1940s, rockets were used to study cosmic rays, in 1958, Explorer 1, the first of the Explorer series of space missions, was launched to study the intensity of cosmic rays above the atmosphere and measure the fluctuations in this activity. This mission observed the existence of the Van Allen radiation belt, in 1958, Eugene Parker proposed the idea of the solar wind. The term magnetosphere was proposed by Thomas Gold in 1959, the Explorer 12 mission led to the observation by Cahill and Amazeen in 1963 of a sudden decrease in the strength of the magnetic field near the noon meridian, named the magnetopause. In 1983, the International Cometary Explorer observed the magnetotail, or the distant magnetic field, the distance at which a planet can withstand the solar wind pressure is called the Chapman–Ferraro distance. Mercury, Jupiter, Saturn, Uranus, a magnetosphere is classified as induced when R C F ≪ R P, or when the solar wind is not opposed by the objects magnetic field. In this case, the solar wind interacts with the atmosphere or ionosphere of the planet, when R C F ≈ R P, the planet itself and its magnetic field both contribute. 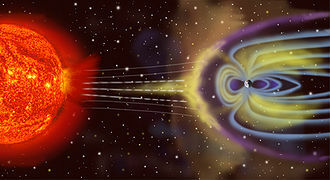 It is possible that Mars is of this type, the bow shock forms the outermost layer of the magnetosphere, the boundary between the magnetosphere and the ambient medium. 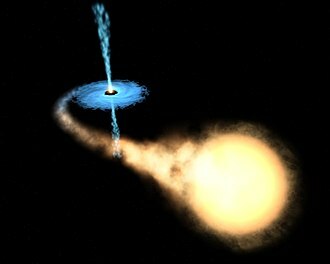 Artist's conception of a black hole drawing matter from a nearby star, forming an accretion disk. A 1998 false-colour near-infrared image of Uranus showing cloud bands, rings, and moons obtained by the Hubble Space Telescope's NICMOS camera. This fault scarp was created by the 1959 Hebgen Lake earthquake. Photo taken August 19, 1959. Nitrogen dioxide 2014 - global air quality levels (released 14 December 2015). The internal structure of the outer planets. One of William Blake's illustration to his The Song of Los, scholars have traditionally identified the figures as Titania and Oberon, though not all new scholarship does. This copy, currently held by the Library of Congress, was printed and painted in 1795.